Okra is mostly used to make savoury dishes by many of its fans around the world. When cooked it can be quite slimy, which causes some people to shy away from eating it. Okra is a very important ingredient in the making of the national dish of Barbados, Cou Cou and Flying Fish. The slime that comes from the cooked okra is used to create a very smooth texture to the Cou Cou, similar to mashed potatoes. Okras can be boiled or fried and eaten alone, or they can be used alongside other vegetables and meats to make cold salads, steamed vegetables, casseroles and stir fries. It can also be used to make soup! 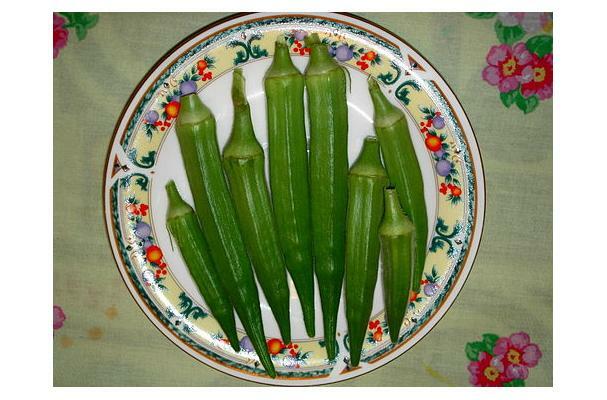 Okra pods are well formed and straight with fresh appearance in dark green color. Pods are tender and nor fibrous. Food complements: Goes well with tomatoes, Onions, Corn, Peppers, And eggplant. Choosing: Look for young pods free of bruises, tender but not soft, and no more than 4 inches long. Buying: You can find okra frozen, pickled, and canned, and in some regions, you might find frozen breaded okra for deep frying. You can find these in any local supermarket or grocery stores. Procuring: Grown in tropical and warm temperate climates. Okra pods are immature fruits and are harvested when they are very rapidly growing. Harvest typically occurs 3 to 7 days after flowering. Okra should be harvested when the fruit is bright green, the pod is fleshy and seeds are small. After that period, the pod becomes pithy and tough, and the green color and mucilage content decrease. Look for young pods free of bruises, tender but not soft, and no more than 4 inches long. Okra may be stored in the refrigerator in a paper bag or wrapped in a paper towel in a perforated plastic bag for 2 to 3 days, or it may be frozen for up to 12 months after blanching whole for 2 minutes. History: Okra comes from a large vegetable plant thought to be of African origin, and it was brought to the United States three centuries ago by African slaves. The word, derived from the West African nkruma, was in use by the late 1700s.